Red bell peppers are the members of the family of mild peppers which belong to the capsicum family. They are known as bell peppers due to their bell-like shape and have a mild, sweet flavor and a crisp juicy flesh. Although these are available all over the world, they have their origin in South and Central America and Mexico. All varieties of bell peppers including the red ones are green in color when unripe. Red bell peppers are botanically fruits but they are known as vegetables which are used in a variety of dishes due to their mild, sweet and crispy flavor. On ripening they turn into bright red in color with a core inside containing plenty of seeds. They are usually comparable to soft balls in size, but they can be smaller depending upon their growing time. They are excellent sources of nutrients such as vitamins C, A and B6. Besides, they also contain vitamin E, vitamin K, folate and potassium; and antioxidants as well. Organic red bell peppers should be preferred to conventionally grown ones since they are eaten with their skins and the conventionally grown peppers often come in contact with harmful pesticides which leave their residue on their skin. For your benefits, we have divided the various benefits of red bell pepper under connected sub headings. 1. Red bell peppers are a healthy option that can form part of your daily diet as they contain phytonutrients which have powerful antioxidants in them. These antioxidants counteract environmental toxins and cell degradation. They protect your body from free radical damage that causes the development of cancer. Thus, bell peppers help in preventing different types of cancers in stomach, colon, breast, prostate and lung. 2. Red bell peppers provide 300 percent of daily vitamin C intake. Apart from being a powerful antioxidant, vitamin C is vital for proper absorption of iron. Thus, those suffering from iron deficiency can consume red bell peppers with their iron source to facilitate maximum absorption. 3. Snacking on red bell peppers helps in treating and preventing inflammation in the body. It is a great option for energizing yourself if you are overwhelmed with stress or feeling fatigued. 4. The combination of vitamin B6 and magnesium in red bell peppers aids in decreasing anxiety, especially due to pre-menstrual symptoms. Being a natural diuretic, vitamin B6 is great for reducing bloating and preventing hypertension. 5. 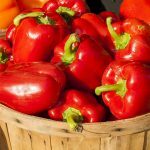 Red bell pepper is an excellent source of vitamin A, providing about 75 percent daily requirement of vitamin A per cup. Vitamin A is a nutrient that supports healthy eyesight, particularly night vision as it aids in the function of the retina and prevents the development of cataracts. 6. Red bell peppers aid in weight loss. One cup of sliced red bell pepper provides only 31 calories and no fat or cholesterol. Moreover, you can burn more calories by consuming red bell peppers as they can activate thermogenesis and increase metabolic rate. Red bell peppers do not contain capsaicin that imparts heat to other peppers. Consequently, they have a mild thermogenic action that boosts your metabolism without increasing the heart rate or blood pressure like other varieties of peppers. 7. Half a cup of red bell pepper provides about 1 gram of fiber which facilitates healthy digestion and maintains cholesterol levels. It also offers protection against colon cancer and helps in the treatment of constipation and irritable bowel syndrome. 8. Red bell peppers can form part of a healthy diet containing a variety of fruits and vegetables which reduce the risk of developing chronic diseases such as stroke, type-2 diabetes, heart disease, high blood pressure and some type of cancers. 9. Red bell pepper provides 7 percent of the daily value of potassium per cup. This mineral is needed by the body for regulating the level of fluid inside and outside the cells, contraction of heart muscle, and intestinal peristalsis which helps in elimination of waste from the body. 10. By facilitating iron absorption, vitamin C in red bell peppers aids in the formation of bone collagen, cartilage, muscles and blood vessels. Red bell peppers contain twice the amount of vitamin C than their other varieties which makes them extremely beneficial for your skin. Some of their benefits for skin are as follows. 11. Vitamin C contained in red bell peppers helps to form collagen, a structural fiber that is needed to hold everything together. Collagen is required by your skin to remain healthy and even minor deficiencies in vitamin C can cause skin problems. 12. 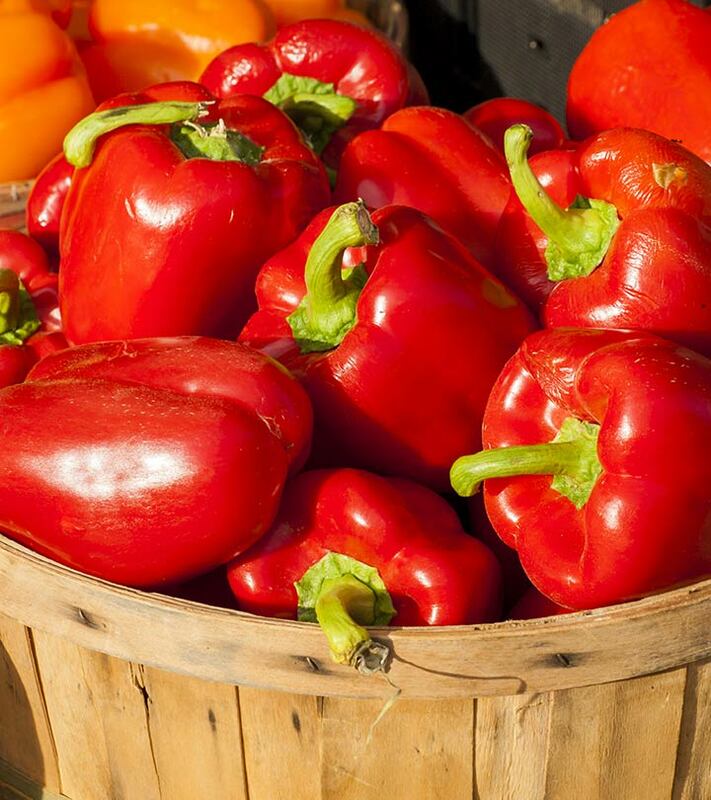 Red bell peppers are great sources of three cancer fighting carotenoids: lutein, beta-cryptoxanthin and zeaxanthin. Apart for being excellent for skin, these carotenoids help in reducing swelling caused by arthritis because of their high silicon content. Red bell pepper juice is also known for its healing qualities. Apart from their health and skin benefits, red bell peppers are beneficial for your hair in the following ways. 13. As pointed out earlier, red bell peppers are great sources of vitamin C which is involved in the formation of collagen. Hair follicles require collagen to stay healthy and for optimum growth. Deficiencies of vitamin C can cause dry, splitting and brittle hair. 14. Red bell pepper can be very beneficial in preventing hair loss as it improves blood flow to stimulate hair growth and protects the hair follicles from the effect of DHT. 15. The spiciness of red bell pepper can help speed up hair growth by over 50 percent. Boil a few slices of red bell pepper in water for 10 minutes and cool it for 15 minutes. Then apply it on your scalp for 30 minutes and rinse away. Doing this regularly will stimulate hair growth. Red bell peppers are a healthy option provided that you are not allergic to them. Also, ensure to store the red bell peppers away from meat to avoid them from getting infected by bacteria. Hope you liked the article and would include more red bell pepper in your diet. 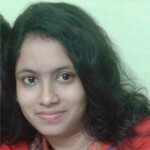 Do leave us a comment.